Sign in to your webmail. 1. Interval - How long in hours to leave before another auto reply is sent to the same email address. If you want to just send one email put a high number in here (e.g. 200). 2. From - Normally the same as your email address. 3. Subject - The subject line for your auto responder. 4. Body - This is the message you would like to send in your auto reponse. 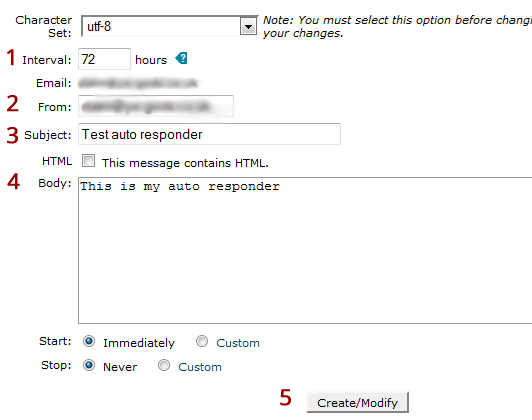 Click the 'Delete Autoresponder' button to confirm your deletion.